Many of our stallholders use January as a time to recover from the busy time over Christmas, to do a deep clean of their premises or even to take a holiday, but by February many of them are ready to return to the market. This coming Saturday, 10 February 2018, will see the return of a good number of them. We’re delighted to welcome back Malcolm Dearmer from TOC Aromatherapy, makers of extraordinary soaps and lotions, Tom and Nicola Smith who run Muckle Brewing, the microbrewery based at Park Village near Haltwhistle, Tracy Thompson from Northern Ark Nursery at Longhorsley (spring must be on the way!) and Ian Nixon of Spicy Monkey who is returning after an absence of almost a year. You can find more information about all our stallholders on the producers page. 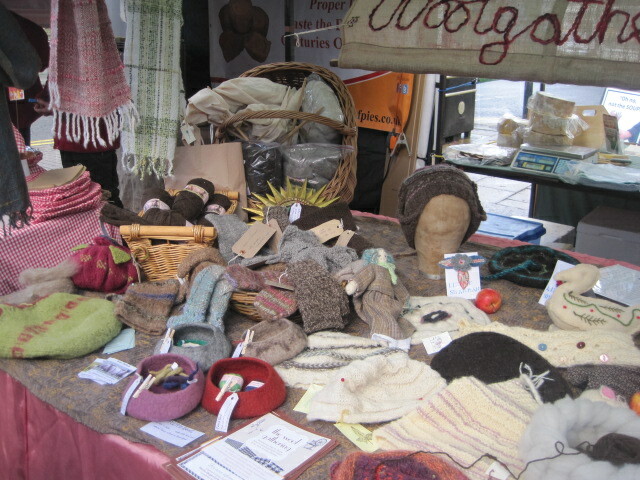 We also very pleased trhat the Tarset Wool Gathering will be joining us once more as a guest this weekend. A small group of wool crafters based in the North Tyne Valley they’ll be bringing locally produced wool and a range of products they’ve made with it. The market takes place on Saturday 10 February 2018 and runs between 9am and 1.30pm. We’re delighted to be launching our new website today, 8 February 2018, and hope you’ll find it useful and interesting too. Thanks to the work by graphic designer Marcus Byron from Hexham, all our publicity has the same look and feel again: you’ll see it reflected in our banners which are up around the town in the run-up to the market, in our flyers giving you dates for the farmers’ market, and in our fortnightly ad in the Hexham Courant.